Hello! It’s almost been five years since we started Six Foot Plus, so it’s about time we upgrade a few pieces that go into making the “podcast for those who like it spooky.” We also have plenty of cool stuff sitting around this remote corner of the Front Office of Gravediggers Local 16, so why not kill two birds with one tombstone? In over to offset operational costs (hosting, domain renewal, recording & editing software upgrade, etc.) we’re running a SCAREPACKAGE promotion up until November 1st. Buy a SCAREPACKAGE, and the money will directly go into helping keep 6ftplus going. Plus, you’ll get some neat, creepy stuff in the meantime. For $5 — you get a selection of buttons, stickers and Halloween goodies. It’s like Trick or Treating without leaving your house! For $10 — you get the buttons, stickers and Halloween goodies, but also a random* CD of a band featured on Six Foot Plus. 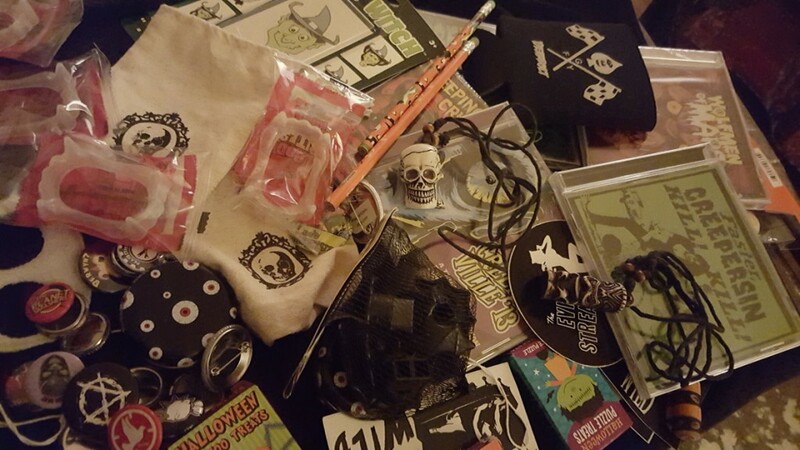 For $20 — the DELUXE scarepackage gets you TWICE the buttons, stickers and goodies. You’ll also get a CD and some EXTRA special spooky stuff. It could be a tiki necklace, a second CD, a 7″ record or possibly dirt from the grave of H. P. Lovecraft. Packages will begin shipping in October. To ensure you get your scarepackage by Halloween, please make your purchase by October 16th. Scarepackages will be on sale until the first week of November. Even if you don’t buy a Scarepackage, thank you for listening and supporting Six Foot Plus.